A Loaded Question From a Follower = A Great Blog Post! First of all i just wanted to tell you how fascinated i am with you and your page! Just when I think I'm doing amazing, I look at something on your page and I'm like WOW!!!! But as always, I have a few questions. Writing: what do you use? Do you have a specific curriculum? is this when you use your Writing units? How is it organized? My writing center is designed based on each students level. All of my students and 9 different IEP goals and essentially, have their own work. Currently, I have 7 students who use my WRITING CURRICULUM for the main source of their writing work. They use the various levels (tracing, boxes, copying and independent) to practice their writing. I have two student who are working on BASIC tracing skills. They have different worksheets in plastic sleeves that they practice every day. They practice tracing lines, shapes and pre-writing shapes. I use a lot from the handwriting without tears program for these two students. Then my last student is working on constructing a sentence on his own with sentence frames. I pull from several different resources to provide work for him. All in all- my students spend 15-20 minutes a day at the writing center. They are all working towards their own writing IEP goal. I keep all of their monthly material stored in their WRITING FOLDER at my writing center so that the center is ready to go each and every single day with NO PREP! 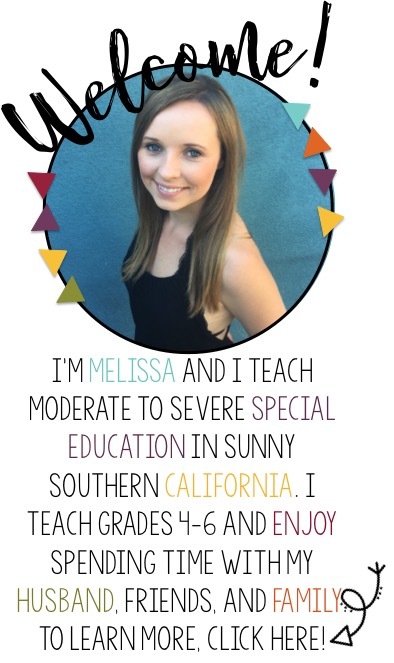 Click HERE to read more about my curriculum I designed for student with special needs. Reading: what do you use? Do you have a specific curriculum? is this when you use your vocab units? How is it organized? I do not use a specific curriculum for reading. LIke my writing, I use the reading IEP goals to drive their academics. The spend 15-20 minutes at the reading center each day where they get a lot of instruction. I have 6 students working on sight words. We practice fluency and increasing "mastered" sight words. This is simple sight word practice. I have 2 students working on matching and identifying the letters of their name. I have created different formatted file folders for these students to practice this skill. I have 1 student who is working on matching real objects to pictures for their reading goal. I store this in sets of 10 in a freezer size zip log baggy. I store the pictures and objects all together to pull out to practice! Lastly my one kiddo uses the read naturally program. It's WONDERFUl and I absolutely love it! Read HERE to learn more! Science: what do you use? Do you have a specific curriculum? How is it organized? Honestly- Science is hard for me to elaborate on. I create my own thrown together units from resources online both free and paid. I also pull from gen-ed curriculum to make it complete. Science is the most fun and the kids LOVE it. I typically use a lot of manipulative and hands on activities for science to keep it interesting. FOr sure- one of my favorite resources are from The Autism Tank and her TpT store. She has great science units to use as a "starting" point for the month. I keep science fun and try to incorporate other skills such as reading,writing and math while learning the science vocabulary! Math: what do you use? Do you have a specific curriculum? is this when you use your Math units? How is it organized? For math- I use my own math curriculum for 9 of 10 students. I have it leveled to meet each of their needs. I really like it because it is a systematic double sided worksheet every day that goes with my writing units. It promotes independence for my students because each worksheet is the same format every day and they know what to expect. The levels that I have are : big/small more/less, counting quantities, addition with visuals, subtraction with visuals, addition/subtraction with number line. I will have a bunch more out in the future! My last student uses the touch math curriculum. All of their work for the month is stored in their math folders at the math center. While it's a lot of prep once a month, it makes my day to day planning SO easy. I am able to come late and leave early knowing that everything is ready for the next day! Technology: I know you have a blog post about how you run your technology, but i don't get it (Sorry) What technology do your have? How do you use it? Technology is a self run center. Staff assist with the transitions from table to table and help set the students up at the technology table before they go back to their station to assist with math/reading/writing and science. At the technology table my students either play with iPods, iPads or computer. Click HERE to read more about my technology check in system that keeps it running smooth! I hope this isn't to much to ask? I appreciate your input!! OF COURSE IT"S NOT TO MUCH! I love all of your questions and feedback. While I can't always respond right away, just know I'll get to it when I get a chance! Do you use discrete trial for anything? Thanksgiving Special Educators Blog Hop! Time To Get Ready For December! Monday Motivator- Thankful for Bloggers! Sensory Toys on a Budget! To Hug or Not To Hug…. That is the Question!